Chicken and mushroom crepes with mushroom sauce are common throughout Eastern Europe. In Russia, they are known as kuritsa i gribami bliny s gribnym sousom (Курица и грибами Блины с грибным соусом). These filled crepes are technically known as blinchiki and are made with white-wheat flour but another popular unfilled and unrolled Russian blini, often served with caviar, is made with a combination of white wheat and buckwheat flour and sometimes yeast. Note: while there are multiple steps to this recipe, this blini dish is broken down into workable categories to help you better plan for preparation and cooking. In a large bowl, whisk together the eggs, egg yolk, milk, sugar, and salt. Gradually add the flour, whisking until smooth. Let stand 30 minutes. Then whisk in the club soda. 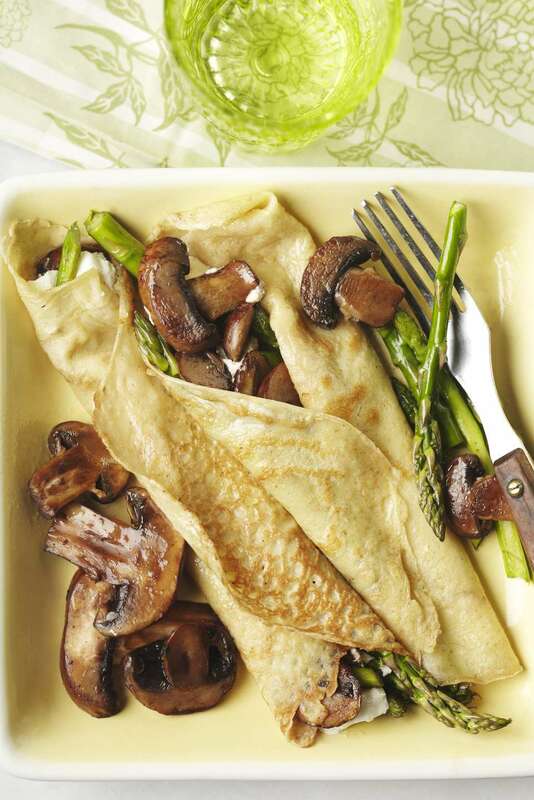 Heat a nonstick crepe pan or skillet over medium heat. Add about 2 1/2 tablespoons batter to the pan while rotating so the batter completely covers the bottom of the pan. Fry on 1 side until golden, about 1 minute. Flip and fry the other side for about 10 seconds. Remove to a plate and repeat with remaining batter, stacking crepes on top of each other. They shouldn't stick together but if you are concerned, place small pieces of waxed paper between them. Melt the butter in a skillet over medium-high heat. Add the fresh mushrooms, onion and garlic. Sauté for about 10 minutes or until mushrooms are tender and most of the liquid has evaporated. Combine with chopped cooked chicken. Mix in 1 beaten egg as a binder. Season with salt and pepper. Place about 1/4 cup of filling into the bottom center of one blinchik. Fold the bottom portion up over the filling. Fold the sides of the blinchik over the filling and then finish wrapping the blinchik with the stuffing away from you, in much the way you would make an egg roll. Repeat with the remaining filling and blinchiki. Heat a large skillet over medium heat. Add 1 tablespoon butter and 1 tablespoon oil. Working in batches, place blinchiki in the pan and sauté on both sides until golden brown. Add remaining butter and oil as needed. Keep warm. Place the dried porcini mushrooms in a heatproof bowl and pour 2 cups boiling water over. Let steep 1/2 hour. Meanwhile, in a medium saucepan, sauté onion in butter until caramelized. Add cremini mushrooms to the saucepan once the onions are translucent. Using your fingers, lift the dried mushrooms out of their soaking liquid and add to the pan with onions and fresh mushrooms. Carefully add the soaking liquid to the pan, making sure not to disturb the sediment at the bottom. Add base, and salt and pepper to taste. Bring to a boil, reduce heat and simmer, covered, 30 minutes. In a medium bowl, fork blend 2 tablespoons flour into sour cream. Temper the sour cream by adding 3 ladles of hot mushroom liquid, 1 ladle at a time, and whisking until smooth. Slowly pour the tempered sour cream into the mushroom sauce, whisking constantly. Simmer 5 to 10 minutes until thickened and raw flour taste is cooked out. To serve, place 2 to 3 blinchiki on a plate and nap with the mushroom sauce. Garnish with chopped chives or dill and sour cream, if desired.